I have had ice cream on my mind because of my upcoming ice cream event. So, I thought I would make edamame ice cream. I bought the edamame beans but decided that I had become a little too engrained in the ice cream theme. I wanted to make something with soy that showed soy’s wonderful natural flavour. Since my mother was in town at the moment, I asked her to walk me through the steps of making soy milk and dessert tofu. My parents have been cooks all their lives and food runs strong in my family. (For my part, I have been to pastry school and have experience working in the industry, although I currently work in another field.) My mother has been making homemade soy milk and dessert tofu for many years, but it is only now that I have gone into the kitchen with her to learn. The process of making soy milk and dessert tofu is similar. The only difference between the recipes is the ratio of water and the addition of cornstarch and gypsum powder in the dessert tofu. The taste of fresh homemade soy milk is much better than most store bought, and homemade can be sweetened to your liking. The dessert tofu is light, smooth and delicate. It is the kind that you find in restaurants, often served with a sweet ginger syrup. I find that the soy milk and the dessert tofu bring back fond memories of my childhood, especially all the wonderful things that my mom made in the kitchen. 1. Soak 2 cups of dried soy beans in a large bowl with a lot of water. The beans need to soak overnight, or for at least 6 hours, until softened. 2. When the beans have finished soaking, drain in a large sieve or colander. 3. In a blender or food processor, add two cups of soaked beans with 3 cups of water, and blend until finely pulverized. 4. Pour the mixture through a fine sieve, cheese cloth or a fine mesh straining bag into a large bowl. Strain out as much liquid as possible. 5. Pour another 3 cups of water over the ground soy mixture, straining and incorporating as much of the soy flavoured liquid as possible. 6. Repeat steps 3 to 5 until you have no more soaked soy beans. Discard the excess soy bean pulp. 7. 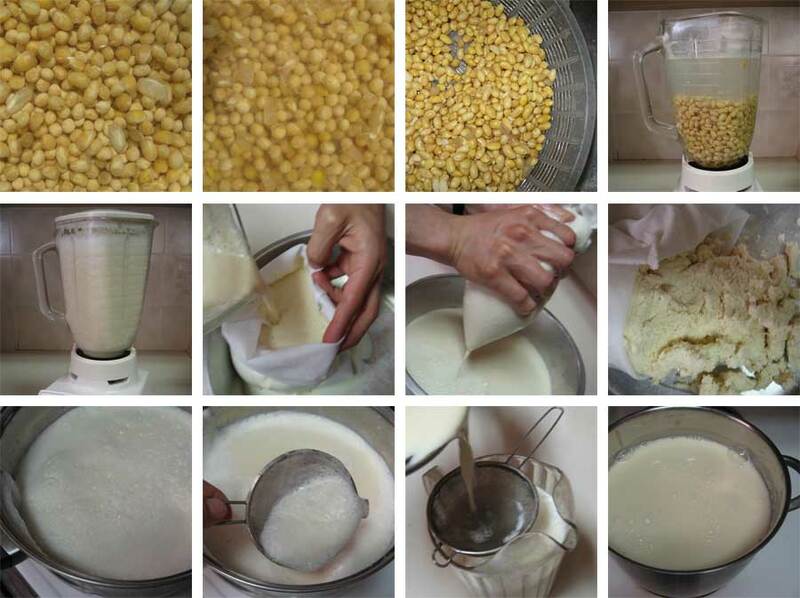 When you are done, remove excess foam on the soy milk with a small sieve or spoon. 8. Then pour the soy milk through a fine sieve one more time and place in a heavy bottomed pot. 9. Bring the soy milk to a boil on medium heat. The mixture should be stirred often. Pay attention, as the soy milk can boil over suddenly, or worse may burn. 9. After the soy milk has come to a boil, take it off the heat and let it cool. You can drink it hot or cold. If you like your soy milk sweetened, as I do, I recommend adding sugar while the soy milk is hot, because it will dissolve easier. For this amount of soy milk, I found that 1/2 cup of sugar worked well. However, I suggest you add sugar to your taste. Once cooled, store in the refrigerator for up to one week. Makes approximately 4 liters. 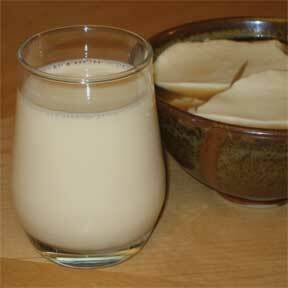 Fresh soy milk is simple, tasty and nutritious. 1. Soak 3 cups of dried soy beans in a large bowl with a lot of water. The beans need to soak overnight, or for at least 6 hours, until softened. 3. In a blender or food processor, add two cups of soaked beans with 2 1/2 cups of water and blend until finely pulverized. 4. Pour the mixture through a fine sieve, cheese-cloth or a fine mesh straining bag into a large bowl. Strain out as much liquid as possible. Then pour another 1/2 cup of water over the ground soy mixture, straining and incorporating as much of the soy flavoured liquid as possible. 5. Repeat steps 3 and 4 until you have no more soaked soy beans. Discard the excess soy bean pulp. 6. Once you are done, remove the excess foam with a small sieve or spoon. 7. Then, pour the soy milk through a fine sieve one more time and place in a heavy bottomed pot. 8. Bring the soy milk to a boil on medium heat. This mixture should be stirred often. Pay attention, as the soy milk can boil over suddenly, or worse may burn. 9. In a small bowl, add 1 1/2 tsp cornstarch and 1 1/2 tsp gypsum powder to 1 Tbsp water. Place this mixture into a large casserole dish – one that has a lid. 10. Once the soy milk has come to a boil, pour it into the casserole dish. Do not stir. All you need to do is place the lid on the dish and let it cool for 30 minutes. 11. Once cooled, you can carefully spoon the tofu into bowls. Eat it warm, or put it in the refrigerator and have it as a cool refreshing dessert. 12. As I mentioned above, dessert tofu of this kind is very soft and silky. It is often served with sweet ginger syrup. Makes approximately 10 cups. 2. In a saucepan, combine ginger, water and sugar. 3. Simmer on low until sugar is dissolved. Posted by Sam at 2:05 a.m.
Wow , you certainly went all out and the result looks amazing! PS I'm ready to push PUBLISH for the ice cream event! It'll star a LOCAL specialty! Hi Sam, I found your blog via Cream Puffs in Venice - thanks for such an informative post on making soy milk - the pictures are great too, I had no idea it was so simple. when i heard the theme of soy... images of soy milk and dau fu danced in my head. luckily you chose to make it and it looks utterly fantastic. very well done! wow, never thought of making this! Well done! hi! I came across your blog via Cream Puffs, and I'm delighted by your post about dessert tofu!! Is this tofu the "silk tofu" oftenly used in vegan cakes and tartes? I'm having some troubles in translating gypsum powder in Italian... can you help me? What an informative post. I have to admit I don't know very much about soy. I admire your creativity! I sure hope Vancouver appreciates your talents!!! This post was really fun. Not only did I get to learn about soy, but cooking with my mother was fun and insightful. How do Mom's know so much? They are simply amazing!